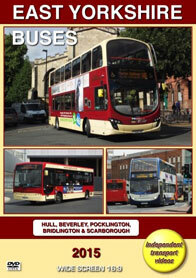 We journey over to the eastern part of the county in this DVD programme featuring the buses of Yorkshire. We start in the city of Kingston upon Hull with some archive video from the camera of local bus photographer, Malcolm King. Filmed in 1989 and the early 1990s Malcolm has captured the bus scene, which shows the two main operators in action. These being Kingston upon Hull City Transport and East Yorkshire Motor Services where we see a variety of buses in operation. In 1989 Hull City Transport was celebrating 90 years of service and had three Dennis Dominators with East Lancs bodies, 135-137 (E135-7 SAT) featuring three past liveries. We also see various Roe bodied Leyland Atlanteans, some dating from 1969 in service alongside MCW Metrobuses. Interesting single deckers are dual purpose East Lancs bodied Scania N112s dating from 1988. There is also a former Leicester City Transport Leyland Titan PD3 (89 HBC) on driver training duties passing through the busy bus station. East Yorkshire, now in their deregulation livery of red and grey are seen in action. Representing that fleet are Leyland Nationals, Bristol VRTs, and former Greater Manchester Transport Leyland Atlanteans, as well as Atlanteans from Northern General with ECW bodies, and from Cleveland Transit one with a Northern Counties body. Some former London Transport Routemasters are also filmed. (You can see them in full on our “Routemasters in East Yorkshire” DVD). A brief visit to the EYMS depot in Anlaby Road is taken where we see a preserved Leyland Lion/Burlingham bodied coach (DV 7890) that originated with Devon General.. A preserved Bedford OB is also seen in the bus station. We now fast forward some 25 years to see the buses in Hull filmed by independent transport videos own cameras. The scene has changed beyond recognition! Not only have the buses changed, but also the backgrounds! The old bus station has now gone and has been replaced by the Paragon Interchange! One thing that has remained the same is the East Yorkshire depot in Anlaby Road in Hull! This is where we start our visit and get a brief view of their former Bristol Omnibus Bristol FS6G with convertible ECW bodywork for use on special occasions and witness the daily maintenance work taking place in the depot. Now moving into the city we film at over ten locations. These include the Paragon Interchange, Prospect Street, King Edward Street, Queens Dock Avenue and Drypool Bridge. As before there are two main operators in the city, East Yorkshire and Stagecoach East Midlands (the vehicles carry Stagecoach in Hull fleet names which was the successor to Hull City Transport). The EYMS fleet has a good mixture of Volvos including B7TL, B9TL and B7RLEs. There are ADL Tridents, ADL E400Hs (hybrid) as well as ADL200s and ALX300s on Volvo B10BLE chassis. Stagecoach features their usual modern selection, but watch the DVD to find out more! From Hull our cameras move around the county. We visit Beverley and then continue to Market Weighton, Pocklington, Bridlington and finish at Scarborough. Here we catch up with some Arriva North East vehicles as well as the open toppers that run along the seafront in this long established seaside town. EYMS buses operating local services are branded Scarborough & District. We hope you have enjoyed this programme and watch out for more action from Yorkshire in future DVDs.